I have to say I was throughly surprised when I arrived at St. Paul’s. I had no idea how ginormous and glorious the building would be as well as how impressed I was when I stepped through into the cathedral. Going to the top of the dome was also a breath taking experience. The view from the top of the dome was incredible. I felt like I could see all of London. Overall my experience at St. Paul’s was amazing I will never forget the complete feeling of awe that was instilled in me as I started to take in my surroundings. I hope one day I will be able to visit again! 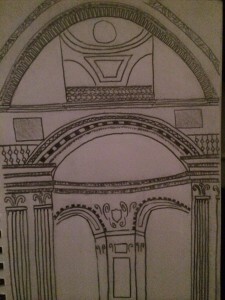 Posted in ReligousBuildings, Sketches	Bookmark the permalink. ← What a 2 days it has been! I totally agree with you, St Paul’s was amazing. The climb was long and I still feel it a bit, but it was totally worth it for that view at the top of the dome. I also thought it was so funny watching people on the whispering wall on the way up – people from all around the globe entering this one area to whisper things in every language against the wall. The inside was beautiful as well, I loved the intricate details all over. Overall, it was definitely an experience I will not soon forget. I forget who Aimee was talking about, but another student on the trip described the feeling it evokes as sublime, and that is definitely the truth. I hope to return someday. I absolutely agree! It was somewhat surreal coming into such a vast expanse of space. As I began to feel less overwhelmed in the nave. I noticed the level of detail and intricate design that surrounded me and once again I was filled with a sense of awe and inspiration. The five-hundred plus steps to the top of the dome also left my head spinning but it was well worth the view! St. Paul’s Cathedral truly blew my mind and is nothing short of divine. I would highly recommend visiting this land mark for the beautiful architecture and the spiritual experience. It’s been two days ago now and I still cannot get over the tremendous experience St. Paul’s Cathedral was. While approaching the structure I did not realize just how large the building was. I realized how massive it was when I tried to take a picture and could not fit it all in one frame. I originally was not overly excited to see the cathedral, and did not understand why we were spending so much time there. That quickly changed as I entered the great structure. I could spend a month trying to adsorb the view inside the building. It was just incredible. Once inside I truly realized how massive St Paul’s Cathedral was. I am not even sure what impressed me more. The size or the incredible detail that was decorating every square inch of interior. We unfortunately we’re not allowed to take pictures inside the building. I do not think a camera could capture the feeling the Cathedral created, so instead of sharing pictures with my friends and family, I will encourage them to make the trip someday. 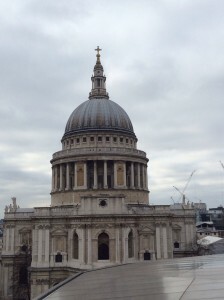 After experiencing St Paul’s Cathedral I truly think everyone should try to visit the fantastic building! St. Paul’s was completely breath taking, but I do have to agree about the dome being my favorite part. 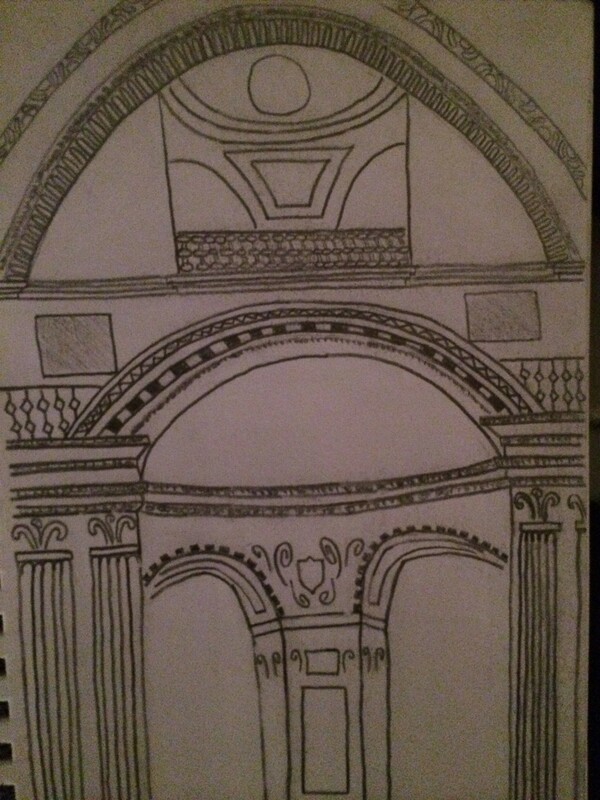 Shelby, Ruben and I did are sketches for the cathedral in the whisper gallery and I noticed all the different languages around me was amazing. But the funny part was while we were sketching the boys made me laugh really hard for a brief minuet and I guess I have a loud district laugh on top of being in a dome that echoes,because two different people came up to me, on separate occasions that day, to tell me they heard me laughing but couldn’t figure out where I was. So I guess all of St. Paul’s got to hear me for a brief minuet.